At the beginning of the year, I took my sister and her best friend into the city so they could visit the MET. After an afternoon of wandering through the galleries and sculptures, we made our way outside — back into the mid-afternoon sun and the cold breeze. “Nah.” My sister and her friend didn’t want adventurous foods. They preferred pizza, hamburgers — they were even excited about Chick-fil-A. “I am not eating Chick-fil-A.” I didn’t want to eat at a restaurant we could visit back home. I wanted something unique to NYC. “How about ramen?” My sister and her friend never had ramen before. Since they couldn’t give a better lunch recommendation, we decided to find the dumpling/ramen restaurant. Real Kung Fu Little Steamed Buns Ramen is easy to miss. The storefront is tiny — so much so, that when you enter you are immediately standing in the dining room. Several wooden communal tables lined the left-hand side of the room. Two-top tables were against the right-hand wall. Some were pushed together to make four-top tables closer to the back of the room. A small narrow aisle went back to the kitchen. I was worried as I looked at the communal tables, that there wouldn’t be enough open seats for us to sit clustered together. Luckily, we hovered by the hostess podium until enough people left, so that we could sit together. The hostess — a young woman in a fuzzy pink sweater and skinny jeans — led us to the table, leaving the menus at our seats. Our server came over and place a small plate, napkin, wooden spoon, and chopsticks for our setting. The girls gave me wide-eyes, as they never ate a complete meal with chopsticks. I showed them how to hold them — having learned the first time myself eating ramen at one of my favorite restaurants. It was easy to bump into the people around you as guests got up from their seats. I found that most of the diners were Asian couples and younger students — dressed like hipsters and playing on their phones. There was one trio of business people to my left. Pairs of people stood against the windows near the hostess podium looking for the best seat. A giant mural on my right had beautiful details, creating a branded-decor for Real Kung Fu. Natural light came through the front windows, shining more than the large metal grates with spotlights that hung from the ceiling. 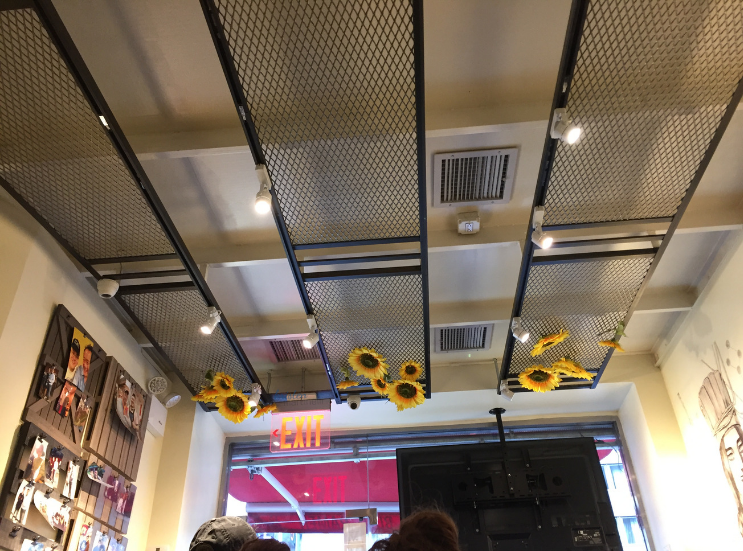 Oddly enough, fake sunflowers hung from the metal grates, giving a country vibe. The menu was plastic and categorized its dishes in an easy way. I’ve had a few Shanghainese dishes before, but I never tried soup dumplings. We knew that the point of stopping at Real Kung Fu was to have a warm dish. I was most interested in trying the ramen, though the menu offered other dishes that focused on the hand-pulled noodles, like Lo Mein. We ordered the steamed vegetable dumplings as an appetizer. A note on the menu indicated that the dumplings would take 20-minutes to make. Our order arrived with our meal, which was fine. The delay in timing means the dumplings were fresh and made-to-order, which I would always prefer. I loved that they were piping hot — golden and crispy on one side with the fresh dough wrapper. Inside was the soft, steamed veggie filling. The sauce was soy-based and gave the needed boost to the dumpling’s flavor. Overall, I would give these a 6 out of 10. They were yummy and I was happy for the attention to detail with the handmade wrappers. The flavor was not blow-me-out-of-the-water impressive, but that’s just my taste. I didn’t find anything different or special about Real Kung Fu’s edamame, compared to what I make myself at home. The appetizer was a small handful — salty, chilled, al dente. My sister and her friend picked this appetizer because they have had it before. I would’ve preferred to try the marinated pigs ears (found on the full Kung Fu Kitchen menu) as an appetizer, but I compromised. The edamame was a 10/10 only because it’s impossible to cook these incorrectly. I knew when the pork soup dumplings arrived, I was going to love them. The inconsistent shape told me these were handmade. Presented in their bamboo steamer, these soup dumplings looked like swirls of whipped cream with their heavy base and twisted top. I was hyped to try these. The girls watched me as I used my chopsticks to grab the twisted top and balance it halfway onto my ramen spoon. I realized then, that I didn’t know how to eat these soup dumplings. I didn’t have a bowl to place it in — so if I broke the wrapper, the rich broth (the best part of the dumpling!) would spill out onto my plate. The soup dumpling was larger than a clementine, so I knew I couldn’t eat it in one bite (as you do with sushi). Even if I could, I didn’t want to scald my mouth with the broth. I took a small bite of the wrapper near the top, using my chopsticks to balance the broth in the small purse shape it made. I slurped the rich broth — chewing the tender pork until the dumpling deflated enough to eat it in one bite. My sister and her friend struggled to eat the dumpling off their wide wooden spoons. Most of their broth ended up on their plate with the edamame shells. I give these soup dumplings an 13/10 — they are to die for. I should’ve ordered another batch for my meal; they were that good. I can see why the NY Times wrote about Real Kung Fu Little/Kung Fu Kitchen for their soup dumplings. When I looked around the restaurant, nearly every other table shared a type of dumpling appetizer. My recommendation if you’re going to visit Real Kung Fu or Kung Fu Kitchen, is to order the dumplings (or two), and consider having it for your main meal. My experience with ramen up to this point has been set by the rich flavors from Ramen Nagomi. So you’ll imagine my surprise when Kung Fu’s beef ramen was placed in front of me. The broth was light and clear and layered with fresh herbs like scallions and parsley. A few pieces of bok choy wilted in the broth. “Is this how it normally is?” My sister asked. “Not from my experience.” I said. I confirmed the ramen ingredients from the menu. I guess I had been expecting the nori, corn, egg and other toppings that I had eaten in other ramen dishes. I decided to order the green tea egg, which was listed separately on the menu. As a tea-lover, I was impressed with the idea of combining green tea as the marinade for eggs. If you’ve heard me ramble about Japanese soft-boiled eggs, then you know why I wanted to try Real Kung Fu’s green tea eggs. I ordered two, one for my ramen and one for my sister (her friend didn’t want to try it). It didn’t have any flavor. The green tea only darkened the outside of the egg, but didn’t infuse it with any noticeable flavor. It was cold, and tasted like a crumbly, hard-boiled egg. Go ahead and take a peek at the luscious soft-boiled egg from Ramen Nagomi. You have the creamy yolk which mixes with the rich ramen broth, and the delicate egg whites which are marinated in mirin for some sweetness. Real Kung Fu’s green tea egg was the exact opposite of this. I plopped Real Kung Fu’s green tea egg into my soup. I tried to use my spoon to break it in half, thinking that the ramen broth would warm the interior of the egg and give it that smoother consistency. Instead the egg yolk (which was hard-boiled), turned into crumbled specs that floated around the ramen. I would not order the green tea eggs again, especially at $3 each — 0 out of 10. Now, I do understand that there are differences between Shanghainese and Japanese ramen. Note here, that my thoughts may be biased towards Japanese ramen, as I’ve had more experience eating that. However, if we want to compare apples-to-apples — when I look at the flavors of Kung Fu’s soup dumpling to the flavors of their ramen — the soup dumpling had the developed flavors I was searching for. I would’ve preferred if the filling of the soup dumpling was the ramen broth with the hand-pulled noodles. Then this dish would be a totally different discussion. Use of fresh ingredients: Fresh herbs is always a good choice. Hand-made noodles: The most impressive craft by Kung Fu Kitchen. Click here to watch how the noodles are made. Tender beef: Not outstanding seasoning, but it was tender. Large portion: A deep bowl of broth, three slices of beef, and a large helping of noodles. Ramen broth had no depth of flavor. The chicken ramen was boiled chicken in the same broth, so it really had no flavor. The green tea egg did not add any value to the dish. Now, you may be thinking: Kung Fu was featured in the NY Times, how can you possibly give it low star reviews? Since this is a “First Impression” restaurant review, I think it’s important to show how one meal can determine whether a diner comes back to your restaurant or not. In my case, I would return to Real Kung Fu only for the soup dumplings. I would also want to order one of their authentic dishes like the duck, and see if that flavor combination is better. If after the second meal, I was still not impressed then I would not return. Overall, the lunch we had came to about $75 without tip. I was not surprised with this amount (we were in the city after all) — though I wished I could’ve given my sister and her friend a better first-impression when it came to the ramen. Have you eaten at Real Kung Fu Little Steamed Buns Ramen? What did you think? Is there another dish I should try? Tell me about it in the comments!